The face of a lost boy who found his mother after 25 years. 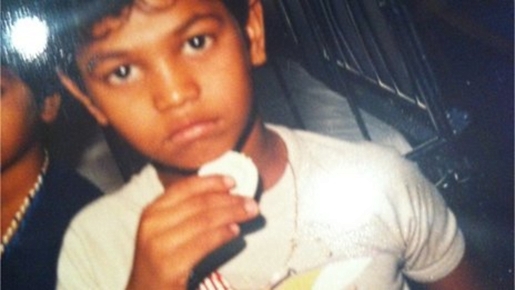 Saroo Brierley wasn’t always bearing that last name. The boy was found on the streets of Calcutta, taken in, and eventually adopted by a couple from Tasmania who raised him as their own. It’s all good fortune for a lost Indian child in one of the most dangerous slums in the world. However, Saroo has not always been fortunate. When he was 5 years old, he was traveling with his older brother, who was a sweeper on a train. While his brother worked, Saroo rested. After falling asleep, the child awoke 14 hours later in Calcutta. Some 25 years later, Saroo Brierley tracked down his birth mother in Khandwa, India, with the help of Google Earth. The fact that Saroo even tracked down his mother is amazing. As a child, Saroo was illiterate and thus, had no idea of the name of the town in which he lived. All he had was vivid memories and a bit of math prowess. He took the time he was on the train, 14 hours, and multiplied that by the speed of Indian trains to give himself a radius in which to look. Then he hit Google Earth, looking at every town and trying to recognize features. Eventually, he found the right place, and armed with a picture of himself as a child, he returned to Khandwa to track down his mother. Saroo and his mother have continued to keep in touch, and Saroo maintains a relationship with his biological mother and his adopted Tasmanian parents.